Clariant, a global specialty chemicals producer headquartered in Muttenz, Switzerland, announced the availability of new blowmolding tools that can help customers evaluate how Clariant color and additive masterbatches perform in real-world applications. The tooling is available for use on full-size production blowmolding machines located in the company’s technical center in Chicago. “This new mold includes the details that customers told us they wanted in prototype tooling,” explained Peter Prusak, Head of Marketing, Clariant Masterbatches North America. “The tooling we’ve had in the past produced flask-shaped bottles, and the broad, flat panels were not as representative of the shapes that producers of liquor bottles and other beverage containers are looking for today.”The new single-cavity tool, which is intended for reheat stretch blowmolding of clear or colored PET polyester resins, produces a 12-oz. (355-ml) round bottle with a long neck and curved sides. The design is intended to reflect current trends for liquor bottles, but can also be used to evaluate wine, soft drink and other food and beverage containers, as well. The tooling can be used to evaluate not only color, but also performance-enhancing additives and barrier properties, as well. 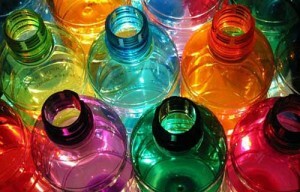 Prusak says that the way plastic materials stretch to create a bottle’s shape can vary depending on the color and other ingredients in the compound. A resin/masterbatch combination that works well in one shape can develop cosmetic flaws or unacceptable physical properties in another. This is why it is so important to produce shapes that more accurately mimic the actual end-product containers. Clariant worked with a few of its customers to design the mold, which is a typical aluminum two-stage blow mold. “We went with a two stage because if it works in a two stage it will work in a one stage, and we have the production equipment for that purpose,” Prusak said. Clariant can make products for both pellet and liquid masterbatch so that customers know how their product will look with a liquid color carrier. When asked about plans for putting equipment and prototype molds in any of its other facilities, Prusak said that currently the capabilities are in Chicago because the company’s Color Works design center is there, making it a natural fit for the tech center. However, there is some consideration being given to installing something similar in the company’s Chino, CA, facility.